Very Good. 336 p. Penguin Modern Classics . Asher Lev is a gifted loner, the artist who painted the sensational "Brooklyn Crucifixion". Into it he poured all the anguish and torment a Jew can feel when torn between the faith of his fathers and the calling of his art. Here he plunges back into his childhood and recounts the story of love and conflict which dragged him to this crossroads. 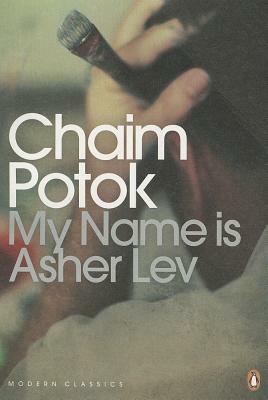 The first novel I bought while recovering from a brutal crime was My Name is Asher Lev by Chaim Potok (1972). I found it in a Goodwill Store. It's a treasure! I am the only daughter of a gifted, African American painter. This coming-of-age story of a young, Jewish boy's maturity into an artist is beautifully rendered by Potok. The descriptions of his Brooklyn community, education, and family background come alive. I found the themes on the value of mentorship for young people to be instructive. As a Christian raised on Bible stories, I looked forward to what Potok was revealing about how faith in or the rejection of God is personal and affects not only your life but other relationships as well. This novel is one that I would give or teach to teeangers or college students given its insight into American Judaism and timeless themes. A masterpiece! This book was recommended to me by my Rabbi (and friend) when I told him I didn't know why I made art - that I simply felt compelled to do it. Reading this book felt like looking in a mirror and seeing the other side of myself. The author so thoroughly unfolds a particular kind of artist's mind and experience, while at the same time imagining what it would be like for someone else to experience that artist. It's beautiful and painful, magical and real. If you're looking for an engrossing novel about family, art, religion, and the pain of growing - well, here you are. I was encouraged to read this by an extremely devout Christian. So it is not a had sell on Judaism. It's merely an understanding of another culture and by far the most powerful book on art I have ever read. The end is a "crescendo"! Asher Lev was born with a gift. The gift of experiencing the world in the manner of a painter, through line and color and shape and texture and composition. The gift of finding his spirit?s expression through the medium of paint on canvas. ?What color is feeling cold?? the young boy asks his mother. From early childhood, he is a member of the religion called painting. Asher Lev, the son of devout Hasidic Jews, was born with a curse. The curse of loving the father who sees in the boy?s choice of a painter?s life the abandonment of his sacred heritage, and who turns from his only son. The curse of loving the intense and narrow world of the Hasid, its rituals and beliefs and passionate concerns, a world that turns against him as he follows the path of his gift. He must learn to be true to himself, the young Asher knows. But which self?